Usually on Monday I like to prepare a simple meal that does not require too many dishes, pots, time and thought. However, last night something came over me and I took on a pretty significant cooking endeavor. 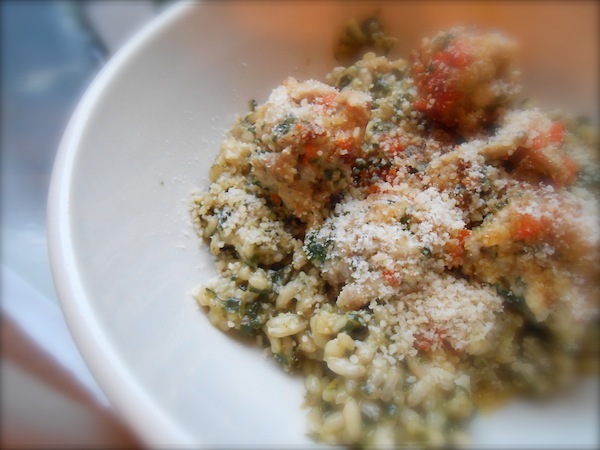 I made swiss chard risotto with chicken meatballs. I found the recipe in La Cucina Italiana. The entree was sensational! Since the recipe came from the hard copy magazine, and they did not feature it on their website, I am unable to link it, so I will share it with you here. This is why I love cooking. While preparing this I didn’t feel rushed at all. I went into it knowing there was a little more to it and I felt such a sense of quietude. Since I work full time, too often I’m rushed to get it on the table because it’s getting late in the evening and there are still too many things to do before bedtime. We especially enjoyed the meatballs using finely chopped chicken thighs rather than ground chicken. This step was the most time consuming, but highly recommended. This recipe is exactly the same words as were used originally in the magazine. It did indeed take 1 hour, 45 minutes and I think it was more like 4 servings, rather than 6 servings. But then we had this as a one dish meal. No sides. Homemade chicken broth made with thigh bones deepens the flavor of the risotto. If time is tight, substitute 4 cups store-bought, low-sodium broth combined with 2 cups water. If using store-bought broth, use 3/4 pound boneless thigh meat or swap in ground chicken. Step 1. FOR BROTH: Remove skin and bones from chicken thighs; set aside meat. In a large, wide saucepan, combine skin and bones, onion, carrot, celery, thyme, bay leaf, wine a pinch of salt and 6 cups of water. Bring just to a boil over high heat, then reduce to a gentle simmer, cook 45 minutes. Meanwhile prepare meatballs. Step 2. FOR MEATBALLS: Cut reserved chicken into small cubes, then finely chop. In a large bowl, soak bread in milk until softened about 1 minute. Squeeze out excess milk and place back into the bowl with chicken, parsley, salt and pepper. Mix until just combined well. (do not over mix). then form 1-teaspoon portions into 1 1/4 inch balls. Step 3. In a large heavy saucepan, arrange meatballs in a single layer. Add carrot, butter, sage and thyme. Cook, covered, over medium heat, 10 minutes. Add wine; bring to a simmer. Reduce heat to low and cook, covered, until meatballs are cooked through, about 5 minutes more; remove and discard herbs. Remove pan from heat; cover to keep warm. Step 4. FOR RISOTTO: In large saucepan with lid, heat 2 tablespoons oil and garlic, over medium heat. Add chard and pinch salt, cook, covered, stirring occasionally, until chard is tender, 5 to 7 minutes. Remove and discard garlic, set aside chard. Step 5. Strain broth into a saucepan through a fine-mesh sieve, cover to keep warm (if using store-bought broth, bring to a simmer, then remove from heat and cover to keep warm). In a medium saucepan, heat remaining 3 tablespoons oil over medium heat; add shallot. Reduce heat to medium-low and cook, stirring occasionally, until softened, about 5 minutes. Add rice; cook, stirring, 1 minute, then add wine. Cook, stirring, until liquid is mostly absorbed. Add 1/2 cup broth; cook, stirring frequently, until broth is mostly absorbed. Continue adding broth in 1/2 cupfuls, stirring frequently, and allowing each addition to mostly absorb before adding the next, until rice is tender yet still slightly firm to the bite. (You may have broth leftover). Step 6. Stir in chard, cheese, butter and , if using homemade unseasoned broth 1/2 teaspoon salt. Adjust seasoning to taste. Serve risotto immediately with meatball and their broth. You were right. This is a fantastic risotto. I’ve never seen a risotto served with meatballs before and this would surely make a very comforting meal — and a filling one — in the Winter months. This one is getting pinned! Thank you so much for pointing me in its direction. « I perfected, in my humble opinion, the brussels sprout!! You are currently reading swiss chard risotto with chicken meatballs (risotto alla erbette con polpettine di pollo) at COTTAGE GROVE HOUSE.